We want to hear the good, the bad, and the ugly! Location: the corner of Sixth and Where Do I Go? The final Iroquoia Trail Test. Man I love this race, and its the last one. There was no question I would be there. Close to home, fun technical rocks, and a great bunch of people. Sign me up. 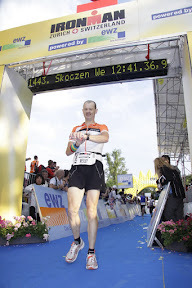 I've done it twice before, in '07 and '08, both years I was in marathon training. This year, not so much, spreading myself thin I didn't have many long runs in. Still, it would be the fifth race of the OUSer Trail Series I have done this year, they range from 25-32 K. So most or all of my long runs have been at race speed. My previous times were 3:28 and 3:31; I really didn't have any reason to think I would be any faster this year. The course was in good shape, so when Strider asked if anyone was planning to run around a 3:30 I said sure, sounds about right. I always say I'm not going to start out too fast, this year a 4:58 was my best (slowest) yet. It all on paved road then we head in. The first 7.5 K you head down a ravine, mostly sandy with roots, through a stream and an easy loop beside it, then back to the start. 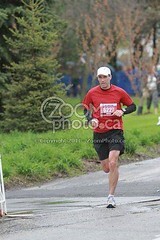 Yes I really did pass West Grey Runner in midstream. Done the first section in around 45 minutes, not as fast as my previous times but that was the plan. Strider and I were talking most of the way here, saw Ed Fizz too. Strangely, my hamstrings had felt tight and ached all morning, which is rare and curious. I was a bit worried at unexplained pain at this stage of the race. Grabbed my water belt loaded with Heed, some gummy chews, and some hammer endurolytes which I was trying for the first time. Heading north now we saw Casual Runner volunteering at Derry Road. This is where the trail gets fun. Rockier sections, mild at first. Then crossing Twiss road we clamber up a cliff like climb. I take the opportunity to eat and tell Strider to go ahead. That's the last I see of him, I guess the 3:30 plan is off. I realize later that I never gave a thought to my hamstrings again; all issues gone. Actually the farther I go, the better I feel. Everything seemed to come sooner than expected: I was genuinely surprised when I reached the canyon with the famous rocky descent. Going up the far side, it didn't seem as steep as usual. All of a sudden, I thought I might just be in for a good race. I was worried when I didn't see Robbie-T coming back until well after the leaders, he mentioned that he'd rolled his ankle. At the turnaround I was around 2:04 which was in between my 2 previous times. Heading back I felt relatively strong. Usually I would fade at some point but today was not too bad. Still those rocks are tricky when tired. Luckily the heat was not too great, especially for this summer. Soon enough it was over, a new best in 3:26:34. Yippee! The first thing I noticed, is that I wasn't all that beat up. 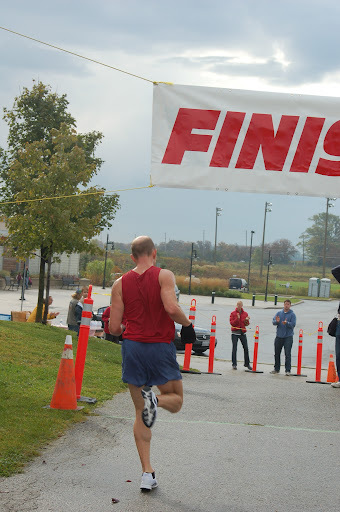 Probably less than after any ~3 1/2 hour race I've ever done. I really did feel like I could have kept going. That's a great confidence boost staring down my first ultra coming up in 3 weeks. Also the PB when I didn't expect it, I was pretty happy. Lots of socializing and food was good. Very unfortunate about R-T's swollen ankle, but at least he finished the race. All in all a pretty fine day at the races. Back at home, spurred on by a comment by Ed Fizz on his itsmyrun log, I started looking carefully at the possibility that the course was shorter this time. Indeed it was; I could see where using my Sportstats maps of all 3 years. I had noticed that my Garmin had measured somewhat less that 32 K, but hadn't given it much thought at the time. Roughly 1.4 K shorter, of fast terrain (near Crawford Lake) but still that's about 8 minutes at my pace. 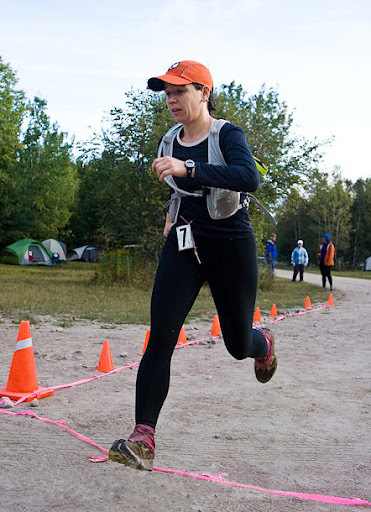 Hey that's trail racing, but of course it takes something away from my PB joy. 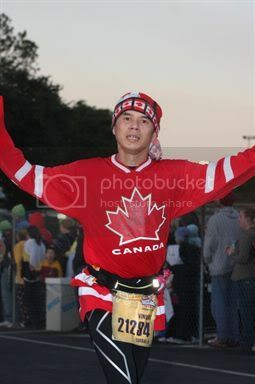 Still my positive energy after 30.6 K is much more important heading towards Haliburton 50. As the day went on, my chronic trouble knee that has been pretty good this year started to swell and hurt a bit. I do think it is temporary, today (Sunday) we hiked for 10 K with only minor symptoms. I will take it very easy for a while. Big thanks to Mrs Strider for the pics. Way to wrap this race up with style. Stay patient and you're going to be just fine for your ultra. You're going to have a great day in Haliburton! "Princess" J0-JO...The Awesome Running Machine. An Ever Loyal and Devoted Official Doonst Fan. At least the wardrobe didn't disappoint! Good Luck at Haliburton - take care of that knee! Life is short. Drink the good wine first! Congrats on a passing the final test! Great race report. Good luck with the taper for Haliburton. Strange thing was that the distance on my Garmin was identical to two years ago. No clue. I think that slow start served us both well. After Twiss when I went ahead I just stayed within my comfortable easy pace and was stunned how good I felt at the turn and the return trip home. We should both take this as a clue as to how to start HF in 3 weeks. Congrats on passing the final test. 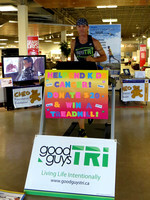 Help Fight Children's Cancer with Sears Canada and GoodGuysTri - 26 Team Mates, All Running 100km, 1 Goal. If you have the time please read my participation page and consider a donation. Congratulations on a great race! It seems like you're in great form going into the countdown to Haliburton. Fingers crossed the knee completely settles down well before then. 2016: Boston, followed by injury rehab and then ??? Consider how much I suffered at the measly Midsummer Night's Run, I'm glad I decide to bail on this. Congrats on a great time! Good run Doonst! thanks for caring about little ol' me. "I just hope that people look at it and say, 'Hey if this yahoo can do it, then I can do it too.' That'd be cool if people thought that. It's just a matter of putting the miles in and working. It's not so much how much talent you have. I hope." - Brian Sell. Strider wrote: Strange thing was that the distance on my Garmin was identical to two years ago. No clue. I think that slow start served us both well. Isn't that confusing, should I be happy or not? I just checked Robbie's Garmin stats from the 3 years on itsmyrun. Everybody has it slightly different, but his do show it around 1.25 K shorter this year. Nicely done Doonst! Happy that you came through unscathed. Nice job, Sheldon! Maybe running alone for a bit took the pressure off so you could just run? Can't wait to read the Haliburton report! and wowwsa - those are some bright shorts! your'e going to rock your first ultra... can't wait!! When I saw you on your way back I thought that you were having a tough day, I am glad that it wasn't the case. 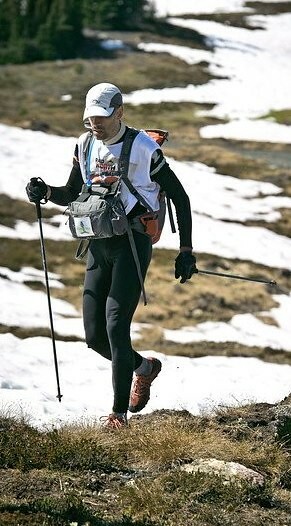 Congratulations on PB and injury free race - I was so surprised to see so many runners with dirt on their clothes or body as a result of contact with ground. Take it easy for a while - looking forward to see your performance in Haliburton - it will be for sure one of the deciding factors on my road to 50 K next spring. sounds like a good time. nice run. looks like you have a great base to smoke the egg nog hills this year (if that's in the plan). Great seeing you again Doonst! Even going off course a few times my Garmin was just shy of 31K. You are in great shape from Halliburton, you just have to tame that speed off the start and you should be good to go for the 50K! Great job Sheldon and great report. Congrats! Well for what its worth the new OUSer Trail Series standings show that the points garnered here were enough to catapult me into second place for over 50 males. After 7 of 9 races, no Star Trek reference intended. (Its there, down on page six). It may not hold though as I'm not doing any more at that distance, in Haliburton I'm in a different category. Gulp. Doonst wrote: Well for what its worth the new OUSer Trail Series standings show that the points garnered here were enough to catapult me into second place for over 50 males. After 7 of 9 races, no Star Trek reference intended. (Its there, down on page six). 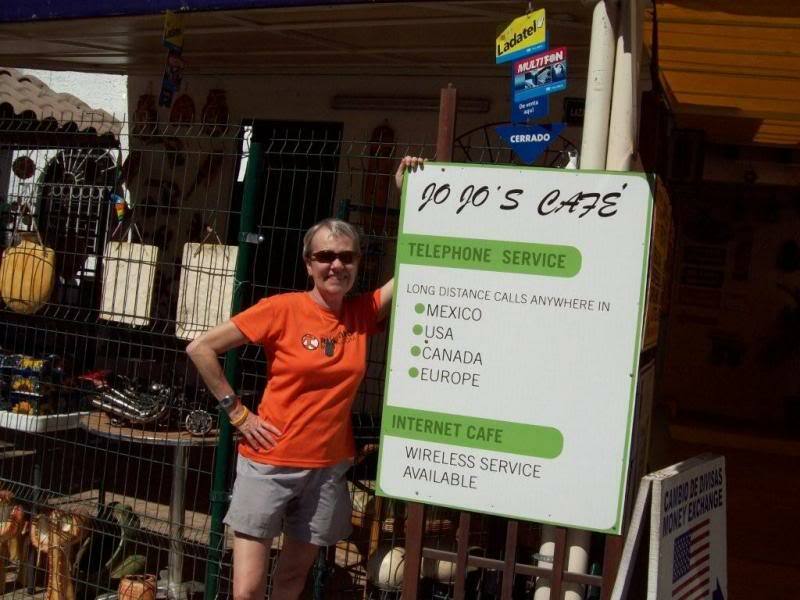 It may not hold though as I'm not doing any more at that distance, in Haliburton I'm in a different category. Gulp. Awesome man!! Seriously that is good work.